Specializing in unique custom design and jewelry repair. 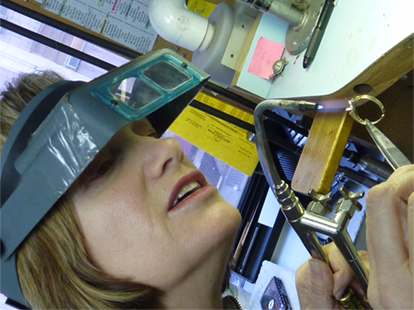 Calla Gold is your Personal Jeweler - a true " Jeweler Without Walls " who takes pride in working with clients one-on-one to integrate their personal sense of style and taste into custom designed jewelry and repaired jewelry pieces. 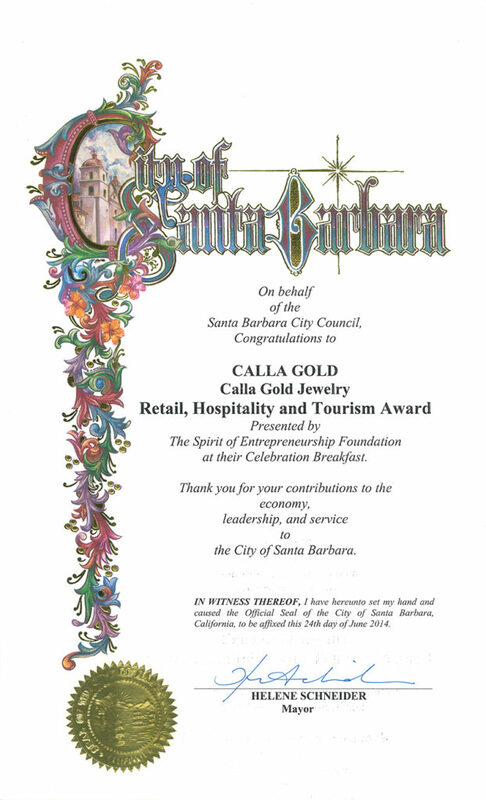 Unlike typical Santa Barbara jewelry businesses, Calla gold has no brick-and-mortar location. 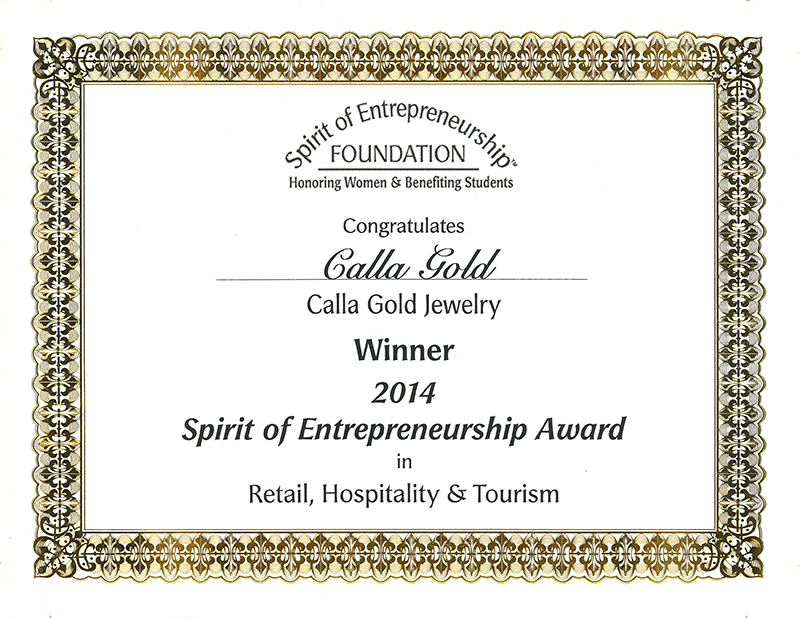 Calla Gold comes to you, bringing you the jewelry collection you want to see and collaborating with you to create unique custom jewelry. 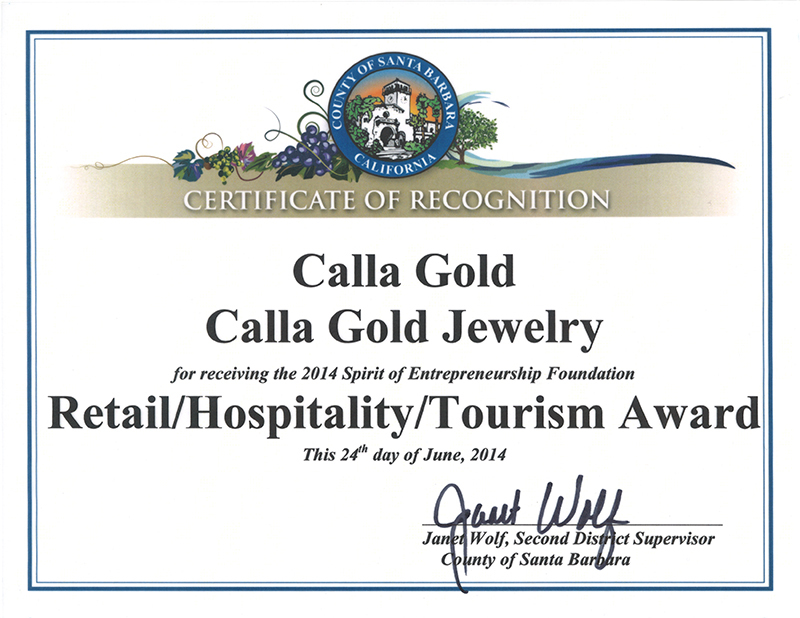 Santa Barbara jeweler Calla Gold personally designs jewelry that comes from your story and your heart. "I'm here to help you find the great pleasure, satisfaction, and delight with your jewelry." Yes, my last name really is Gold. Could that be more perfect? Was I destined to become a jeweler, or what!? I’ve lived in the Santa Barbara area nearly my entire life. I attended nearby schools and worked at local businesses. Accordingly, I’ve developed a close bond with the community in Santa Barbara, Montecito, Carpinteria, and Goleta. 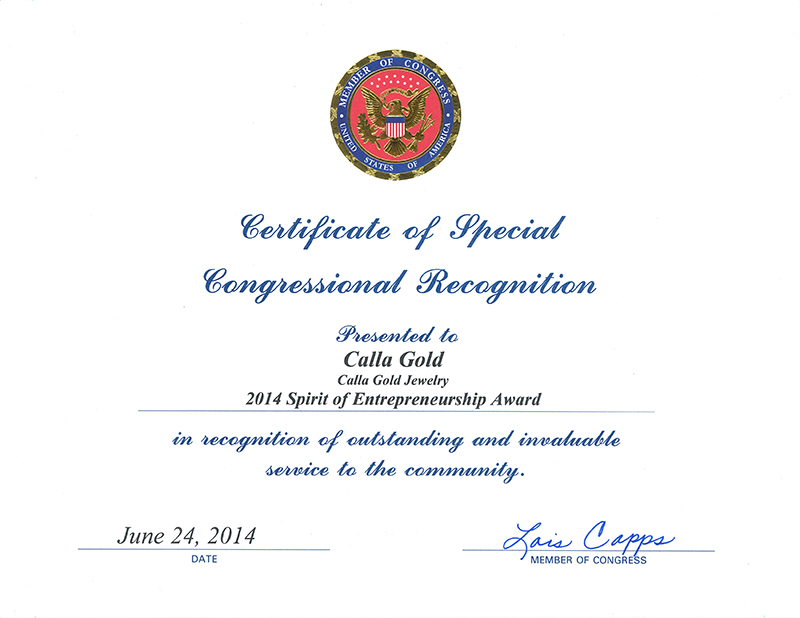 In 1983, I created Calla Gold Jewelry. I’ve been visiting my clients in their homes and where they work ever since. I specialize in helping people select the right pieces of jewelry. The piece you choose should complement your physical appearance, unique personality and lifestyle. I take great pleasure in helping you choose the jewelry that you’ve always desired, whether it’s a one-of-a-kind ring featuring diamonds and precious gemstones, elegant Italian designer chains, and bracelets or wedding rings. I’ll help you find it or I’ll custom make your dream for you. 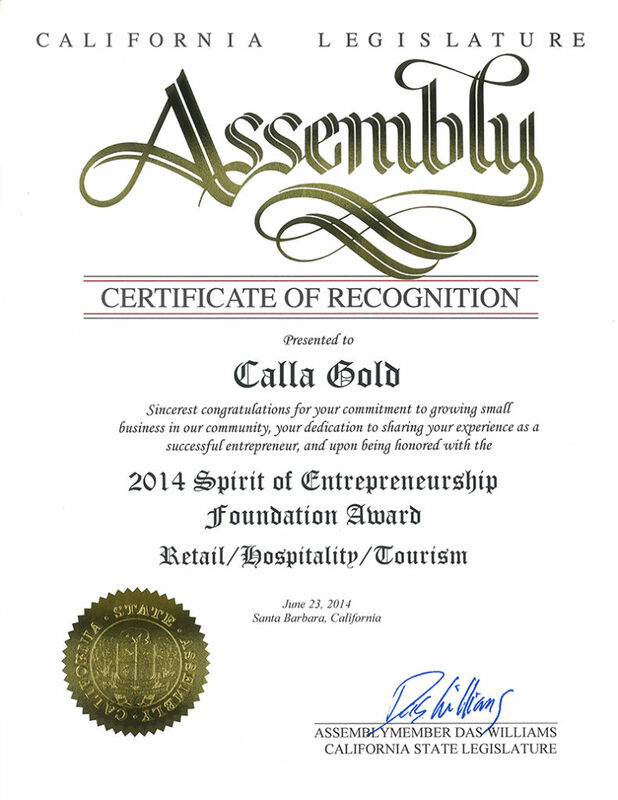 Calla speaks at seminars and conventions as an expert jeweler, designer, marketer and sales trainer. At local organizations, her topics include: "Discover Your Best Look" which teaches how jewelry shapes, face shape and body style relate, and "Revitalize Your Jewelry Wardrobe" which shows many ways to maximize your jewelry wardrobe and re-think your under-worn jewelry with tips on simple changes that make huge differences. She also speaks about small business marketing, networking and organizing leads. Contact her to speak at your next event. 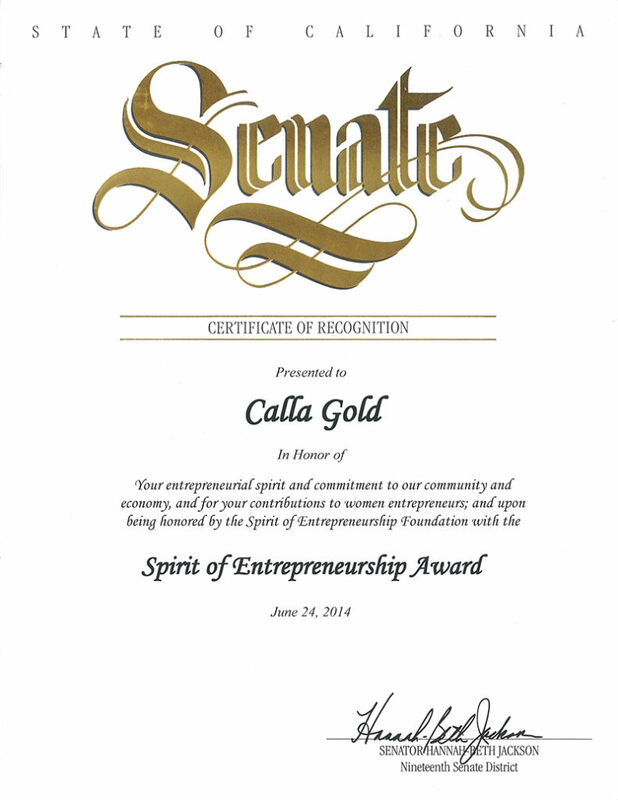 View Calla Gold's Certificates of Special Recognition as a Winner of 2014 Spirit of Entrepreneurship™ Award. Member of the Manufacturing Jewelers & Suppliers of America (MJSA), Founder of SMART: Social Media Action Relationship Team, member of the University Club of Santa Barbara, California Jewelers Association, Santa Barbara Associates, NAWBO Santa Barbara, SABER Santa Barbara, Chamber of Commerce and Jewelers Helping Jewelers. Jeremy Gold makes up a third of Calla Gold Jewelry. His wife, Calla, makes up the other two thirds. Her part includes seeing clients, as well as the more creative elements of the business. Jeremy’s expertise extends behind the scenes. He’s more the organizational and administrative person. He’s the yang to Calla’s yin. 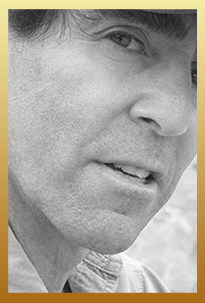 Jeremy has worked side by side with Calla since the inception of Calla Gold Jewelry in 1983 and has lived in the Santa Barbara area for the majority of his life. He has no plans to move—ever.